I love it when somebody breaks down and explains the problems in a report image-by-image. No, seriously. This fascinated me. Of course, my Master's thesis spends a whole chapter doing this to a musical that's probably shorter than that chapter, by hey, I love it. Anyway, this episode had loads of interesting scenes and was full to the brim with action. Maggie, Jim, Don, and even Mac play smaller roles than usual, but Charlie and Will make up for the lack of other characters. The setting is five days during the second week of the Casey Anthony trial, which I had completely forgotten was only fourteen months ago. However, I expect that this storyline will fall below the radar in Part 2, as the news that's breaking to Charlie is a much bigger deal. Well, at least to everyone who isn't a female of maternal age, according to Reese's demographics. With two episodes left in this rookie season, I suspect that the 60-minute blocks will only become more intense, so who knows what else will happen! Oh, the ratings. See, Charlie, Mac, and Will met with Reese, who yelled at them for not covering the Casey Anthony trial, costing them (literally) half of their viewers. [dang! that's crazy!] So, against their wills, the trio agree to start focusing on the case, though they'd rather give their viewers more important information that just some entertainment. Everyone else in the newsroom agrees with our powerhouses, especially when their story ideas (like senate obstruction, the job situation getting worse, and Obama's union relationship) have to be cut to make room for the Casey Anthony story (at the top of the hour, no less). [yeah... that's rough!] Even Sloan is pissed, as she wanted extra time to talk about a big House vote regarding the treasury. [her talking about the "raver/rager" in Baltimore was so odd.] Because the other big news thing going on is the Anthony Weiner twitter picture, Will petitions for three minutes to cover that (in the B-block), which Mac grants him. [I forgot that it was first thought to be a hacked account!] Then, everyone gets right to work on the Casey Anthony mess, with Don giving a lecture on how others are covering it and what isn't being discussed. [my thoughts on this appeared at the top of this post. and that junk about appealing to emotion because there's no judge to stop the media from swaying "the jury" was interesting.] Oh, and why is this even national news? Dylan Kagen goes through bottom-of-the-barrel stories and finds things he thinks are big enough to attract attention. Also, Neal pitches Mac a story about an internet troll website, which Neal wants to do an undercover story on, though he'll probably have to troll News Night to do so. [I have a feeling this is going to be very entertaining as it develops!] He doesn't have enough detail worked out yet, but Mac tells him to keep working on it. Yeah, I didn’t really get how Maggie, as an AP, was somehow ranked below two interns, either. Unless maybe ALL the interns turned AP and they forgot to tell us? Overall though, I really liked “The Blackout”. It’s been one of my favorite episodes of the show so far, despite the latent misogyny that is still shining though, even eight weeks in. I don’t get it; they have all these wonderfully strong female characters, but constantly knock them down over nothing. Look at Sloane and Mac, for example; they’re smarter, more dedicated, and harder working than most of the men. Then Sloane shoves Neal against a wall, twice, over some fictional and baseless shot at her body? Come on, Sorkin. Just let the women be strong. It doesn’t make you less of a man to write them so. I’ll definitely give this a re-watch before Part Two next week though. I missed Part One when it aired, but someone from my Dish Co-Workers group on Facebook sent me the link to it at dishonline.com, where I watched it Monday during my bus ride to work. 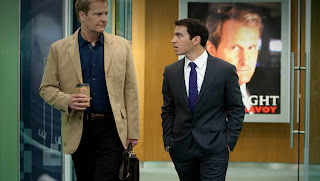 The Newsroom has developed into a really good show; if they stopped knocking their female characters down over nothing, it could be great.